Here at Fireplace Warehouse we know that home is where the hearth lives, and our families deserve the best when it comes to warmth and comfort. 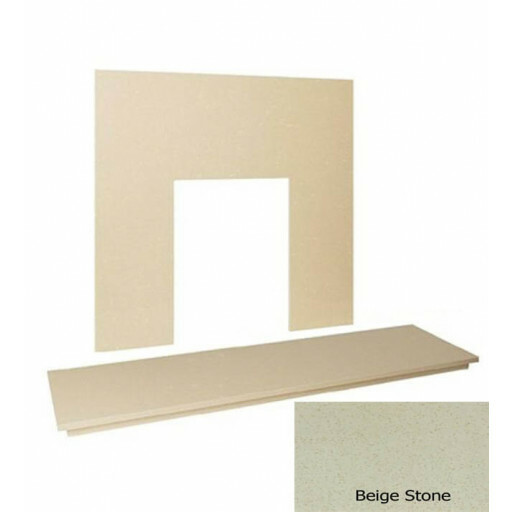 This marvellous 54” Beige, Stone-Marble, matching hearth and back panel set is essential for any living room, family den, or dining area with a fireplace. The hearth stands at (60mm) in height, has a (380mm) depth, and a non-intrusive width of (1370mm). The back panel measures at (940mm by 940mm) and matches perfectly with the Stone-Marble. Included in the back-panel is a standard inset for a gas or electric fire cut-out (420mm by 570mm). Hearths can also be ordered without a cut-out at extra cost to the customer. This hearth is made with the same care and expertise we strive to achieve in every product we make. Every hearth is made with best products available to us and are always priced be of the best value to our customers. Currently available at a discounted sale price, this hearth and back panel set is ready to move into a new home. Various colours are still available.